HÀ NỘI — With more than three quarters of exhibitors attending a recent conference coming from overseas, organisers say it truly is a global affair. The 6th International Precision Engineering, Machine Tools and Metalworking Exhibition & Conference (MTA HANOI 2018), which opened in Hà Nội on Tuesday, saw participants from US, UK, South Korea, China and Taiwan. 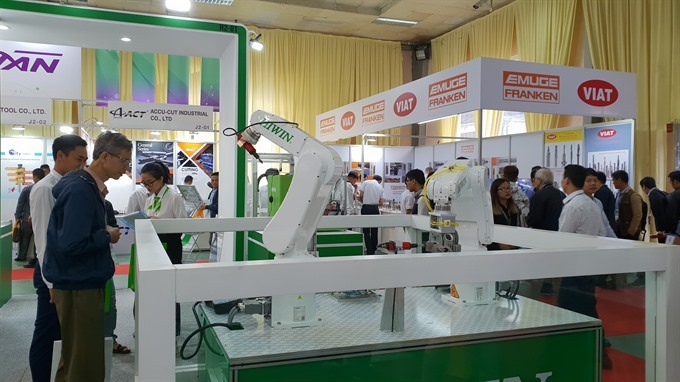 This demonstrates the attractiveness of Việt Nam’s mechanics sector, the organiser said. BT Tee, organiser and general manager of UBM VES, said Việt Nam had signed many multilateral and bilateral trade agreements. The greatest impact of these agreements on the production area is to help reduce investment costs, thereby encouraging investment from the private sector. “These are the reasons why foreign businesses are becoming more and more concerned about the country’s mechanical market,” he said. He added the size of the industry in the south was double that of the north. However, HCM City had focused on slow-growing traditional industries, while Hà Nội concentrated on the electronics industry and information technology. The capital city had a growth rate double that of HCM City, although the scale was only half. This indicated high efficiency in investment in the northern market. However, he said the country’s mechanics sector had faced challenges improving its technologies to meet with increasing outsourcing and production demand. “The Fourth Industrial Revolution has pushed the mechanics sector to a higher level with new smart equipment such as robots and 3D printing machines with outstanding characteristics. “The exhibition therefore brings leading firms with advanced machines and equipment to the northern market,” he added. Covering an area of 4,300sq.m, the three-day event attracted some 165 firms from 15 countries and territories.